According to tradition, the monks of San Giuliano gave the little church of Santa Caterina here to St Francis in 1218. Some of the friars were already settled within the city, near Sant' Apollinare and others now established a small convent beside Santa Caterina. The earliest surviving document relating to the convent on Monteluco dates to 1350, when Pope Clement VI, at the behest of Brother Gentile da Spoleto, allowed the friars here and those of three other hermitages “to observe inviolate ... the Rule [of St Francis] in that purity and primal simplicity in which he wrote it”. However, Pope Innocent VI revoked this concession in 1355, when Gentile da Spoleto was accused of heresy and imprisoned. 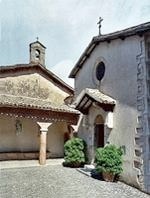 The spirit of austerity survived at Monteluco and its friars became associated with the reformed community that the Blessed Paoluccio de' Trinci established at San Bartolomeo di Brogliano in 1368. Pope Gregory XI approved the way of life of eleven hermitages, including those at Brogliano and Monteluco, in 1373. The friars of this movement became known as "the brethren of the family of the observance" or the "Zoccolanti" (because they wore wooden clogs). St Bernardino of Siena stayed at the hermitage on Monteluco in 1430. When the Blessed Francis Beccaria of Pavia died in 1450, the year of the canonisation of St Bernardino, Andreola, the mother of Pope Nicholas V, arranged for his funeral to be held with great solemnity in SS Simone e Giuda. A new chapel that was built to house his body was dedicated as the Cappella di San Bernardino (see below). The convent passed to the Observant Franciscans as soon as this branch of the order was formally constituted in 1517. The hermitage received new life in 1788 when the Provincial Minister, Blessed Leopold of Gaiche, chose to retire here. In 1798, he famously castigated a group of Napoleonic soldiers and their Spoletan sympathisers (including a number of women!) who erected a tree of liberty outside the hermitage on the anniversary of the storming of the Bastille and profaned the sacred wood by their raucous celebrations under it. The convent was suppressed in the following month, but Blessed Leopold managed to stay until 1811. He was able to return in 1814 and was buried here when he died in the following year at the age of 83. In 1831, Bishop Giovanni Maria Mastai Ferretti, the future Pope Pius IX, found it expedient to flee from Spoleto in disguise as revolution approached. He dressed as a simple priest and took the so-called Corta di Monteluco (see Walk III) to San Francesco. One of the friars then took him to the Osteria di Ceselli, some 13 km to the south east. From there he reached safety in Leonessa. 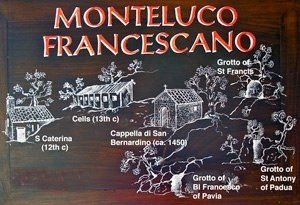 Perhaps because of its remote location, San Francesco di Monteluco escaped suppression in 1860. Pope Leo XIII beatified the Blessed Leopold of Gaiche in 1893. This plan (adapted from one on the wall of the convent) provides a schematic of the convent before the enclosing wall was built. Today, the grottoes of Blessed Francis Beccaria of Pavia and St Antony of Padua are in the woods outside (see Walk III). ✴the Chiesetta di Santa Caterina is reached from the convent cloister. According to tradition, the well in the cloister is fed by water that St Francis released from the bare rock. The Cappella di San Bernardino is visible from the courtyard and the church of San Francesco is usually open. To see the rest of the complex, ask in the modern wing of the convent, opposite the church. This chapel was built to house the body of the the Blessed Francis Beccaria of Pavia. His relics were moved across the courtyard to San Francesco (see below) in 1642. This new church replaced Santa Caterina (see below) as the focus of the regular life of the friars. 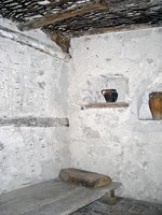 The walls are covered by wooden cupboards that were built early in the 17th century to house a collection of relics that Bishop Maffeo Barberini (later Pope Urban VIII) gave to the friars. ✴the monument (1642) of the Blessed Francis Beccaria of Pavia (on the left wall). Five small cells from the original convent survive, along the left of the corridor that leads to the Oratorio di San Francesco. ✴St Antony of Padua and Blessed Francis Beccaria holding the city of Spoleto in their hands on the right wall. The Crucifix above the altar is a copy of that from San Damiano, Assisi (now in Santa Chiara there) that spoke to St Francis soon after his conversion. As noted above, the monks of San Giuliano gave this little church of Santa Caterina to St Francis in 1218. It subsequently became the focal point for a group of friars who lived as hermits in the surrounding woods. They would meet here to recite the hours and to say Mass.